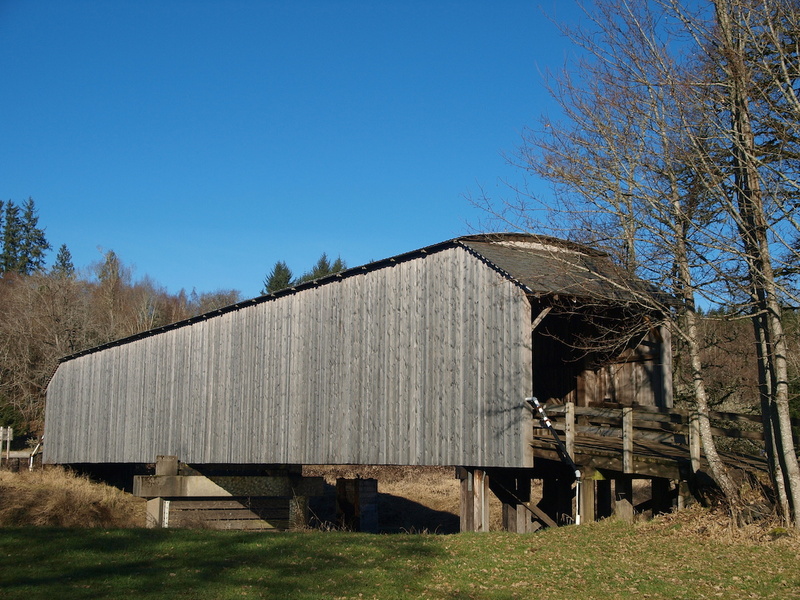 The Gray’s River Covered Bridge was lobbied for by dairy farmer Hans P. Ahlberg in 1905. The county agreed to build it at a cost of $2615.00. Ahlberg owned land on both sides of the river and needed to get a way to get wagon traffic across. An tin roof and cedar siding were added in 1908 (note the sign next to the bridge says 1906) to protect the bridge from the rain and weather. Cedar shingle porches were added in 1915 to protect the entrances. The bridge supplemented an existing swinging bridge that the family had previously built across the river and served Ahlberg and his neighbors quite successfully. A sign in Ahlberg Park talks briefly about the history of the bridge. It was added to the National Register of Historic Places in 1971, but was not well taken care of. In 1987 serious structural damage meant that the bridge had to be taken down. Local citizens and Wahkiakum County raised funds to rebuild and the bridge in 1988. 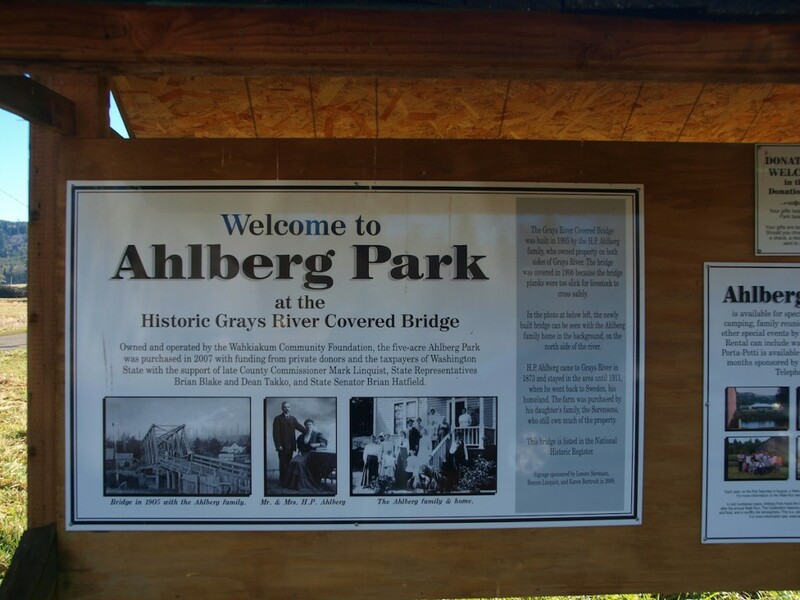 This marked the start of Gray’s River Covered Bridge days held each August in five acre Ahlberg Park. Construction was completed by Dulin Construction in Cnetralia Washington for $295,980.00. The extent of the damage was significant enough that the existing bridge is essentially a new bridge, although as much lumber as possible was salvaged and reused from the original. The rebuilt Gray’s River Covered Bridge near Gray’s River Washington. Head west on Highway 4 from Longview Washington to Gray’s River. At Gray’s River follow signs “Covered Bridge” along Loop Road. Take a right on “Covered Bridge Road.” Bridge will be directly ahead.